Landmark buildings in central London - including Parliament, Whitehall and Scotland Yard - are to be reassessed for potential flood vulnerability. 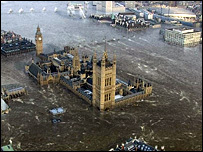 If the River Thames were to burst its banks, the Houses of Parliament, Downing Street and nearly every major Government department could be hit. Whitehall, Westminster, the MI5 HQ and Scotland Yard are all on a flood plain. 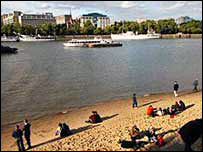 Westminster City Council says it will revise its flooding plans to ensure it is prepared for any eventuality. Westminster's head of contingency planning, Brian Blake, said: "Central London is very well protected thanks to the Thames Barrier to the east and Teddington Weir to the west. Westminster under water - from the forthcoming film Flood. "But given the uncertainty created by climate change and the intensity of some of the downpours we've had recently, it is only prudent to review our plans. "Our job is to look at the worst case scenario and develop a plan to deal with it, and this is something we routinely do with all major incidents that impact on the city, together with other agencies." Two weeks of sustained heavy rainfall could cause severe problems as drains, underground rivers and river defences struggle to cope, the council said. As part of the review, the council's flood review experts will explore the capacity of two hidden river systems, the Tyburn and the Westbourne, to withstand major flooding. It will also investigate whether any further defences are necessary, such as strengthening or raising riverside walls, building further sewerage diversion tunnels or expanding existing ones. The data collected in the review will be fed to other organisations and used to create a co-ordinated response to a flood which protects the life and wellbeing of the public and ensures minimal environmental and property damage. Buckingham Palace is just outside the flood plain, but lies less than 10 metres above sea level. Central London last suffered severe flooding in 1928, when 14 people were killed. London under water is featured in a new disaster film, Flood, to be released in August.